Great news! The AUGI forums are going to be restored! Read the post from BLAUGI! I can't belive I found this in a CAD file! 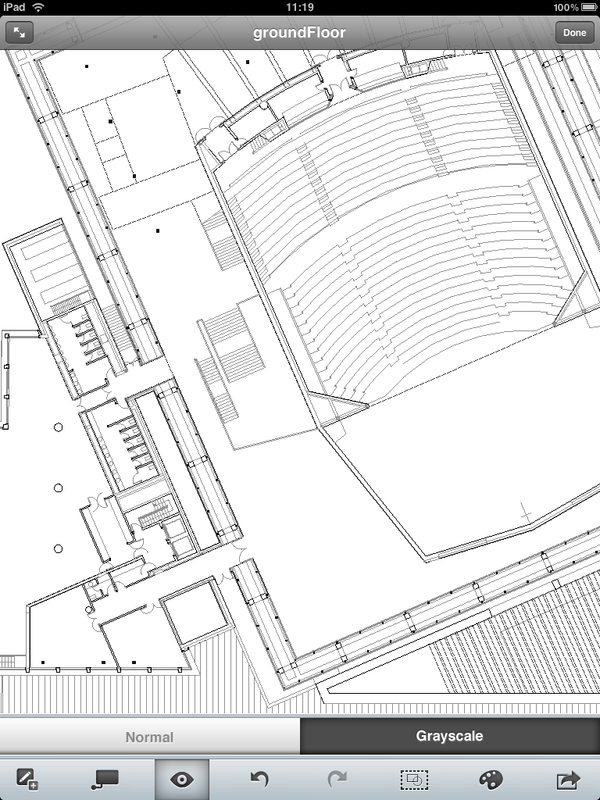 It seems that somebody was watching HULU at work one day, found the link to an episode of "Grey's Anatomy" and pasted it into this DWG file instead of their browser! OOPS!!! I guess they just got busted for goofing off at work! 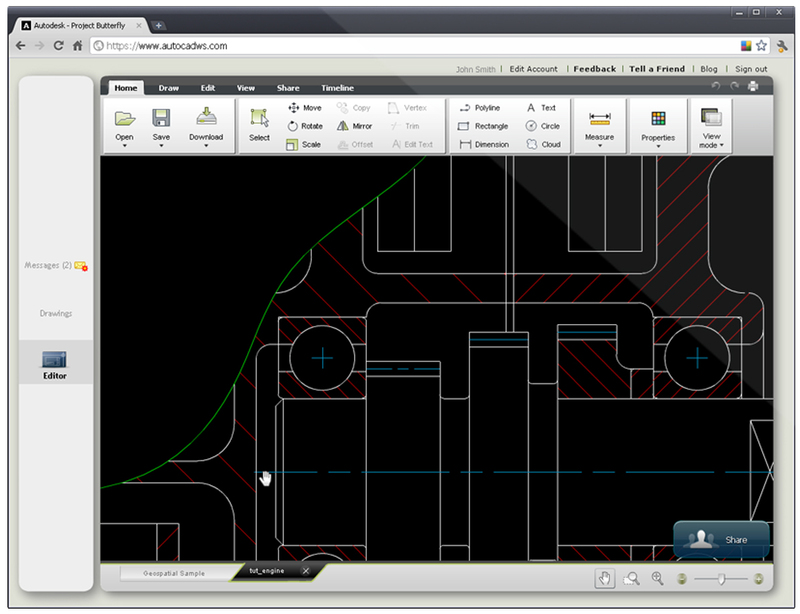 This is the third post in a series discussing the new features in Autodesk's newest release of AutoCAD, AutoCAD 2011. 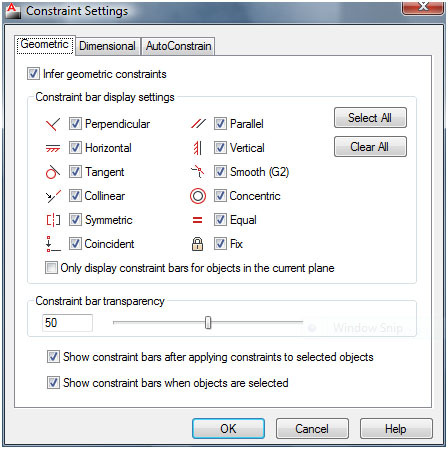 AutoCAD 2010 introduced Parametric Constraints. AutoCAD 2011 made them a bit better. Parametric Constraints are functions in AutoCAD that allow users to “program” their linework. They define and lock in certain design parameters into the model, or linework. 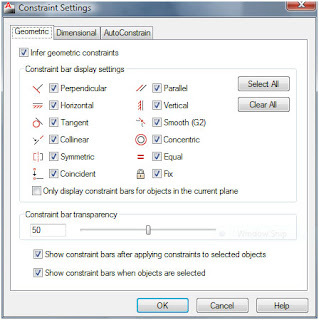 One of the biggest (and best in my opinion) enhancements to constraints in AutoCAD 2011 is the new Inferred Constraints. This function can be toggled on or off (like Osnaps or ortho). The toggle button is on the status bar on the bottom of the screen. Right click on it to bring up the constraint settings. With the Infer Constraints on, constraints are added to your linework as you draw them. It automatically applies coincident constraints for endpoints, midpoints, center points, nodes and insertion object snaps. For example, with this on, when you snap to an object, the infer constraints will apply a coincident constraint to that point. The same goes with editing commands. If you move, copy, rotate, etc., the points you select will have a coincident constraint applied to them. If you place an object with the Nearest object snap, that point will have a coincident constraint applied to it. This is a very powerful design tool that now makes certain your design stay locked and in place. Figure 1: Right click on the status bar to open the Constraint Settings dialog box. there you can toggle the Infer Constraints setting on or off. Other Osnaps like Tangent and Perpendicular will also apply coincident constraints to the objects used. Using the parallel osnap will automatically apply a parallel constraint to the objects. Inferred constraints also affect the way constraints are applied to the rectangle, fillet and chamfer commands. More Geometric constraints can now be applied to ellipses. The parallel, perpendicular, collinear, horizontal, and vertical constraints can now be applied. These constraints can be applied to the ellipses minor or major axis and to another object. After AutoCAD 2010 gave us constraints, one of the biggest requests was for the ability to constrain text. Well, Autodesk listened and we can constrain text now. They can be constrained by the parallel, perpendicular, collinear, horizontal, and vertical constraints. The insertion point of the text is the point constrained to the other object. If you have a roadway or subdivision plan set and you want to label the road, go ahead. Constrain the text with a parallel constraint with the road’s line work and it will stay parallel. Rotate the road and the text will follow. AutoConstrain was already there in AutoCAD 2010, and it is different from Inferred Constraints. AutoConstrain adds coincident points and other geometric constraints based on the command used. AutoConstrain adds geometric constraints after the line work is done. It doesn’t care how the linework was created. It looks for parallel lines and constrains them with the parallel constraint. It looks for perpendicular lines and constrains them as such. In fact, it goes through the user defined list and applies the constraints you want it to, and in a specific order. In 2011 the Equal Constraint was added. It is applied to lines of equal length or to arcs or circles of equal radius. Constraint bars can now be show when you select objects, even if they have been hidden to clear up your screen. Once the selected objects are released, the temporary constraint bars are hidden again. Constrain Icons are different now. They visually indicate if a constraint is for an object or for a point. If it is for a point, there will be a dot in the icon. If it is for an object, no dot. Very simple but it helps you to better understand the nature of the constraint. Since it is visual it also makes the identification process quicker. Figure 2: The Constraint icon on the left is for perpendicular lines. The icon on the right is for a coincident point. Geometric constraints define the geometry of your linework. 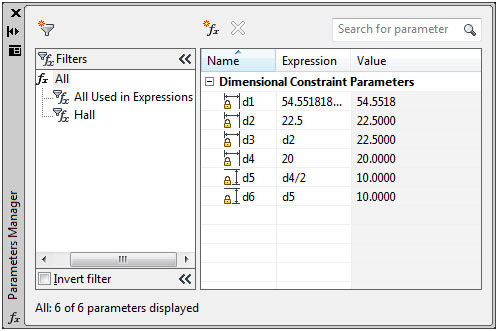 Dimensional Constraints define the length or lengths or your linework. 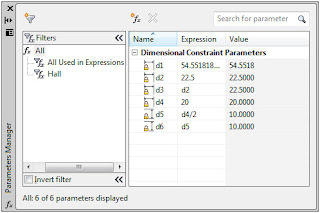 The DIMCONSTRAIN command now has the convert associated dimensions to dimensional constraints as an option rather than this being the default behavior. When you are creating a dimensional constraint, you can now click on an existing dimensional constraint to tell AutoCAD to enter the clicked constraints name into your new constraint. For example, if you dimensionally constrained one side of a parallelogram, as you dimensionally constrain a second side, pick the first constraint to make the second constraint equal to it. This way they will both have the same length. Or you could manually enter in the constraints name of the first side. If there are many constraints in your file it may be difficult to know which constrain is which. With this new feature you can just pick the ones you want to use. One issue with dimensional constraints is that a file can have a lot of them. Every time you add one the list gets longer. The more you use the more there are to manage. There weren’t any good tools in AutoCAD 2010 for managing them. AutoCAD 2011 significantly improves this management process. It now has filter where you can create groups of parameters. For example, if you draw a series of gears, you can create a group of constraints called Gear 1 for the constraints in the first gear. Then you can create a list called Gear 2, and so on. Once a group is created, just drag the constraints into the group they belong in. 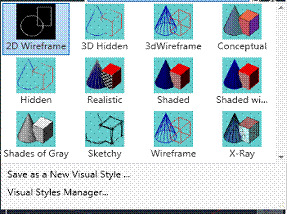 There is also a search box in the constraints manager. There you can search for a constraint or group. Make sure to name your constraints in a well-organized manner. This will help you work them more easily. Figure 3: The Parameters Manager has new features that allow you to group your dimensional parameters into groups. 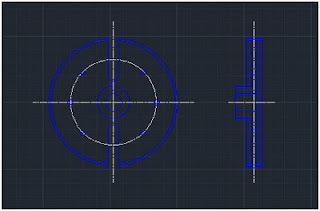 AutoCAD 2011 has added many new features to Parametric Constraints. These new features make it easier to manage your models constraints and make editing them more efficient. You can apply inferred constraints while you create your linework which will save you effort during your design process. You don’t have to go back and apply constraints later, unless you want to. The new start up screen in AutoCAD 2011. Make sure to go through the New features Workshop to see what's new. AutoCAD 2011, the 25th release of Autodesk’s world famous design program AutoCAD, has been released. It has many updates, new features, and new tools added to it. Some of the more flashy additions are the new surface modeling tools as well as the new point cloud abilities. But perhaps the greatest additions are the new design tools that are intended to help your design process and workflow. Don’t be afraid, AutoCAD doesn’t have a new interface again, only a few tweaks. Rest assured that the default background color has changed again. It is now a dark gray. If you want to change it, open the OPTIONS window, go to the Display tab, and click on the Colors button. Pick the option, and then pick the color you want it to be. Since AutoCAD is often used for design drafting purposes, Autodesk decided to change the visual display of the grid to an actual grid instead of the series of dots we have all known and loved for so many years. I have to say that I “never” use the grid; but, now that it looks like graph paper, I will give it a try. Drawing on graphing paper has always been fun, maybe this new feature will make drawing in AutoCAD even more fun than it ever was before! 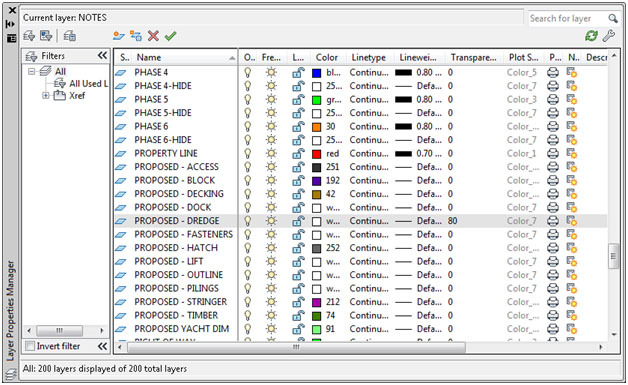 The grid feature in AutoCAD is now displayed as lines in a graph instead of a series of dots. The Quick Access Toolbar has had a face lift. It now displays the name of the current workspace. The workspace selection field has been move from the status bar and placed in the QAT. Click the selection arrow to change your workspace. Out of the box, the QAT now contains the Save As tool. Navigation has a new tool. Yes another! This new tool is called the Navigation Bar. It replaces the navigation tools that were previously on the Status Bar. It can be moved around to either the left or right side of the screen, or to either the top or bottom of your screen. You can even turn it off you want to. The Navigation Bar has the Steering Wheel on it, the View Cube, Show Motion, Pan, Zoom and Orbit. If you are using a 3D Connexion Device (a 3D Mouse) then the Navigation Bar has integrated support for it, when AutoCAD sees the appropriate hardware driver. On top of that, the View Cube can now be used with the 2D Wireframe visual style. If you like the View Cube in 3D, try it out in 2D. The UCS Icon was changed to show a different color for each axis. Red is for the X axis. Green is for the Y axis. Blue is for the Z axis. The cones at the end of each axis line have been removed. The Ribbon has had some minor tweaks and twists added to it; nothing major, just some cosmetic surgery so to say. A new pull down menu option has been added to the Minimize Ribbon arrow button. Before 2011, when you clicked the Ribbon Minimize Arrow, the Ribbon would cycle through all of the possible minimize options one at a time. Now you can set that as the default setting, or you can tell which one of the options (minimize to Tabs, Panel titles, Panel Buttons, or all) you want the Ribbon to Minimize too. This is handy because you can toggle through the full Ribbon, to just the titles, or whichever setting you prefer. If you minimize the Ribbon to Panel Buttons, large icons are shown for each panel. You can expand them by hovering over them, just like when the Ribbon is minimized to Panel titles. The View Tab of the Ribbon has a new Windows Panel. It is similar to the Windows Pull Down Menu form the Menubar of old. 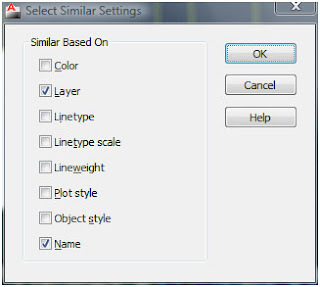 This panel has options to choose between open files, tiling of open files, toolbar display options and user interface options. The toolbar display options works just like right clicking on an open toolbar. It lists the available toolbars in your workspace. Here you can toggle specific toolbars on or off. A new Fold Panels feature has been added to the Ribbon. When you change the size of the AutoCAD window, add or remove Ribbon Panels, the Fold Panels feature comes into play. Fold Panels resize themselves horizontally to fill the available space. When you make a panel a Fold Panel, you can define default, minimum and maximum button sizes. AutoCAD has had five visual styles available for us to use: 2D Wireframe, 3D Wireframe, 3D Hidden, Conceptual, and Realistic. AutoCAD 2011 has added five more visual styles. They are: Shaded, Shaded with Edges, Shades of Gray, Sketchy, and X-ray. AutoCAD 2011 has given us new visual display control tools. These new tools allow us to control the visibility of objects outside of the layer controls. We can now isolate objects based on selection and not just on layer values. These new tools are accessed through the right-click menu. When you use the Isolate Objects tool, only the selected objects will be seen. All other objects are hidden. Right click again to make everything visible again. The second visibility tool is the Hide Objects tool. This tool hides the selected objects, keeping everything else visible. This is useful when you need to work in a busy area of your model. You can use both visual tools at the same time, meaning that you can hide certain objects first, then isolate a few of the remaining objects. Once you have finished working, right-click and pick the End Object isolation tool. Isolated or hidden objects will remain in that state if you end your drawing session. The status bar has an icon that looks like a light bulb. If it is yellow, no objects are isolated or hidden. If it is red, then objects are either isolated, hidden, or both. You can also click the light bulb to start either tool. AutoCAD 2011 has added many new and useful tools. We have only begun going through them. There are even more 2D tools that we haven’t touched yet and there are tremendously powerful new 3D modeling tools now available to us in AutoCAD. Stay tuned. The October 2010 AUGI Hotnews is out. Check out my Tipniques article on the AutoCAD WS Plug-in for AutoCAD. What's Missing from AutoCAD MAC? Autodesk has released a native version of AutoCAD for MAC OS. This release costs about the same as AutoCAD for PC. Both versions can open the same files and do basically the same things, but AutoCAD for MAC is the first version, so it is missing a few things. I have mixed emotions about AutoCAD MAC, but that's ok. I'll be the first to admit that I am not a MAC fan. Every time I think about getting a MAC and actually price them out I can't bring myself to getting one. You have to pay more for less hardware. In fact, it's Intell hardware now so it isn't even a different option. So why pay more for less? I don't know, maybe some day. When I first discovered that Autodesk was working on AutoCAD for MAC I was a bit disappointed. I didn't want Autodesk to be distracted from their work on AutoCAD. I'm not sure that's a valid argument considering how many products Autodesk currently produces and maintains. What's one more right? I completely understand why Autodesk chose to start this new product. Their clients that use Apple computers want it. Once that user base is large enough to support their own product why not? Autodesk already has several products that can be used on a MAC. That also means that Autodesk has the experience needed to get into a new market. So, I have to admit that I have changed my mind about AutoCAD on MAC. I'm ok with it now. I'm not going to run out and get a MAC or AutoCAD for MAC just because it's there. Nope, not me. There are a few reasons for this. As I stated earlier, MACs cost too much for too little hardware that I can get in a PC for less cost. Also, AutoCAD for MAC cost about the same as AutoCAD for PC, but there is less there. Autodesk recently released a list of features that re in AutoCAD for PC that are not in AutoCAD for MAC. This is a great thing for Autodesk to do. I really appreciate it. How many companies release a brand new product and list its shortcomings? Not many. Doing this could keep some users form purchasing their new product. However, I feel that those that were considering buying AutoCAD for MAC are still going to purchase it, regardless of this list. Many of the times on the "what's missing" list are not that big of a deal, but, for me, there are enough key features missing that I would not purchase it, even if I already had a MAC. In all fairness, if I had a MAC I might buy it even with these features missing. I don't know. WOW!! That's just the short list. I know, it's a rather long short list. Keep in mind that this version of AutoCAD for MAC is version 1. I'll bet that many of these missing features will be added in release 2. For now, this list would keep me from switching to MAC and AutoCAD for MAC. But, if I already had a MAC, loved it, and needed a license of AutoCAD, I would consider it, especially if I already used MAC based software. How about you? Knowing what was missing from AutoCAD for MAC would you get it? Why or why not? Have I totally missed the mark on this? How much money do CAD managers make? Do they work part-time or full-time? These questions and more are answered by Robert Green, CAD Manager Extraordinaire, in his annual CAD Manager Survey. Robert takes a look at the average CAD Manager salary, education, age, and even more. If you want to see the questions he asked in the survey follow this link. Survey Questions. Robert conducts this survey every year and the results are interesting to look at, especially in these past tough economic times. You can see the economic tool taken on CAD Managers over the past few years through his survey results. Take a look at it and draw your own conclusions. Is your pay close to the average? How secure is your position? Looking to become a CAD Manager then take a moment to look at this survey, and those past, to get an idea of what might be expected of you. AutoCAD for MAC now available! It’s finally here. AutoCAD for MAC is now available for download. Go to http://www.autodesk.com/autocadformac. Autodesk is expecting a high demand for this download so if you have issues just wait a try later on. The Student community should also be available. Well, fanboys (and fangals) you got your wish. Download the trial and see if it was worth Autodesk’s resources. Remember, AutoCAD MAC doesn’t have every function that “regular” AutoCAD has, but most of what you need is there. What do you think of it? If you have downloaded or logged on and used AutoCAD WS and have formed an opinion about it, Autodesk is interested in your thoughts. If you will be in San Francisco, California, USA on October the Seventh, then here is your chance to meet with the AutoCAD WS Team to share your thoughts. Go to the AutoCAD WS blog and fill out their survey. Have you used AutoCAD WS? What are your thoughts? How will you use it? What did they do right? What did they do wrong? Why? I can't wait to hear your ideas. 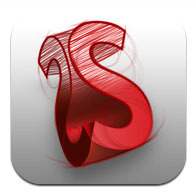 AutoCAD WS is a mobile application for the Apple iPhone, iPod, and iPad. It gives users the ability to view, edit and share AutoCAD DWG files! You don’t have to take your laptop with you to view DWG files, or to edit them, AutoCAD WS can do that for you. AutoCAD WS, formerly known as Project Butterfly) is now out and it is free. It is available in two forms; Web Browser Based (in Adobe Flash) and for iOS devices (iPhone, iTouch and iPad). There are many things that you can do with AutoCAD WS, but there are also many things that you can not do with it. AutoCAD WS is not meant to replace AutoCAD, if it were it wouldn’t be free! 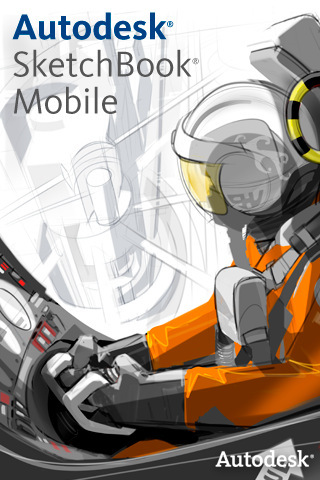 It is meant to be mobile and a means to collaborate with others. The browser based AutoCAD WS is different from the iOS based version. You can do more with the browsers version, but it’s not mobile unless you are running it on a laptop or netbook. AutoCAD WS allows users to upload (only from the browser version or the AutoCAD Plug In) DWG files so that they can be viewed and marked up in AutoCAD WS. If you haven’t tried it out I suggest you do. 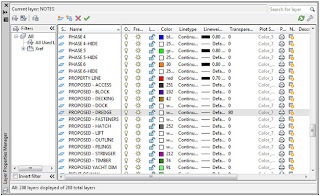 Multiple users can access and edit a DWG file simultaneously. Notes can be taken and viewed by all parties involved. This feature will allow users to better understand drawing discussions, provide the same notes, the same markups, and allow further collaboration. AutoCAD WS is not meant to be a full out CAD program. It is a simple 2D mark up and collaboration tool. 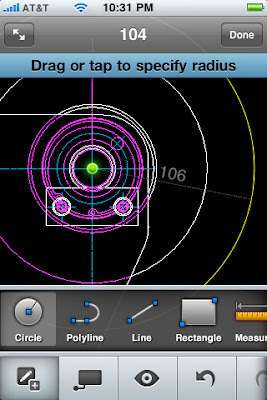 AutoCAD WS Mobile apps are immediately available from iTunes store, plug-ins from www.autocadws.com/downloads, and web app sign-up/account access at www.autocadws.com. I suggest that you check it out. It may be a tool that you can use. My next AutoCAD Training Video is here; Advanced AutoCAD. 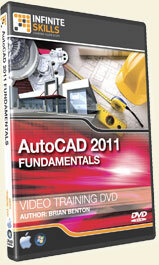 This next AutoCAD Training Video of mine builds on top of my previous title, AutoCAD Fundamentals. Any AutoCAD user that wants to take their skills to the next level will be interested in this new title. This title contains ten hours of training time over 112 lessons. Many of the chapters have a project for you to complete after you have gone through that training segment. The title comes with all of the AutoCAD files that you will need for the sessions as well as other support files. This video will go through and show you how to navigate through your files, advanced operations that can be done with the Application Menu, tips on working efficiently, as well as tools that will make you a better AutoCAD Operator. We delve deeper into advanced tools like the Align command, Quick Select and filters. We also discuss object visibility tools like the Hide/Isolate commands, transparency settings and draw order. Since everyone needs to annotate their drawings we look deep into the complicated settings of Dimension Styles, fields, tables, and how to import and link text from a Word file! I don’t want to bore you with information, but if you’ve ever wanted to export you AutoCAD data or linework then you will want to pay attention to chapter Nine, using Data. And if you hate doing the same thing over and over again, then look at chapter ten: Dynamic Blocks and chapter 12: Action Recorder. This chapter shows you how to record your work and have AutoCAD do it again for you. In chapter Eleven: Parametric Constraints, I show you how to program your linework, locking in your design parameters. If you are interested in customizing AutoCAD then don’t pass up chapter 13: Customization. The last few chapters dig into file management and provide a look at free software from Autodesk that will help you view and markup drawings without ever opening AutoCAD! Chapter 15: Introduction to 3D Design gives a great look at the 3D modeling features that are in AutoCAD. It’s not just a 2D drafting tool you know! Click here to view all of my Infinite Skills Training Videos. Heidi Hewett, Technical Marketing Manager for Autodesk, was kind enough to write a post on her blog, AutoCAD Insider, about my new training video AutoCAD Fundamentals. Thank you Heidi!! AutoCAD Fundamentals puts the "FUN" in AutoCAD Fundamentals! It is also geared for beginners. Don't worry, Advanced AutoCAD Techniques is just around the corner, and I mean just around the corner!! This newest video creation will look at more complicated and advanced tools and techniques. Dassault Systemes, makers of CATIA and Solidworks, put out a free 2D drafting program called DraftSight a few months ago. As soon as I saw this I downloaded DraftSight and gave it to an intern to break. From time to time I also used it in production. Now, DraftSight is available for free on a MAC. If you are running a PC or a MAC you can use DraftSight, for free. I have a few opinions on DraftSght and I would like to share them with you. In short, I feel that DraftSight is both good and bad. My recommendation for it, or against it, will depend on your situation. First, the reasons to use it. It's free. This is the best reason to use it. It's free. What else can I say. It is definitely worth the cost. It can read/write DWG files. 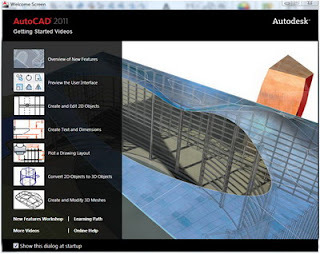 If you are an AutoCAD User/Veteran, it "feels" like AutoCADr14 or maybe even AutoCAD 2000. It's keyboard commands recognized standard AutoCAD keyboard commands. "L" is for "line". 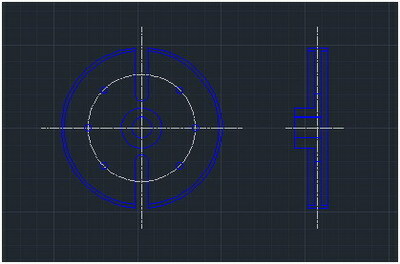 AutoCAD users can work with DraftSight right away. Now, my reasons not to use it. It can only draw in two dimensions. Can not reference PDF files. 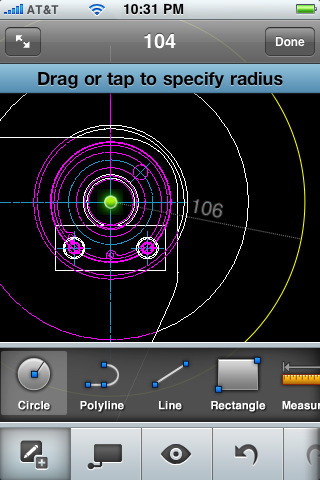 DraftSight is great for making 2D line drawings with no intelligence. If all you and your firm do is make line drawings then you should use DraftSight. If you are a hobbyist or need a drafting tool at home, please use DraftSight. If you produce multiple sheet drawing sets, use something else. If you need aerial images or PDF files in your drawings, use something else. If you need design tools like Dynamic Blocks, or Parametric Constraints don't use DraftSight. If you ever need to create a 3D model, even a basic one, use something else. DraftSight is a great 2D companion program to run alongside a powerful 3D design package, but it can't do everything. 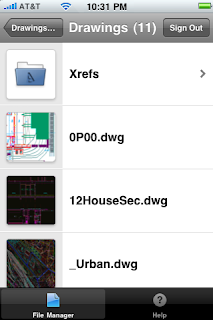 I'll be the first to admit that I am an AutoCAD Fanboy, but I feel that DraftSight has its place. It is an easy to use 2D drafting tool. It's features are similar to AutoCAD r14 or AutoCAD 2000. But it lacks many of the enhanced features that Autodesk has put into AutoCAD over the last ten years. If you want a powerhouse CAD program that can do everything from 2D linework to 2D Constrained Design and all the way to 3D free form surface and mesh modeling, then pay for it and get AutoCAD. AutoCAD isn't cheap, but DraftSight is. DraftSight is limited in what it can do, but if that's all you need why pay for more? Are you looking for a job in the drafting field? This article is a Guest Post from Edwin Chan (check out his website Design Establishment.) and he gives some good advice when looking for CAD or drafting work. As a designer, engineer or drafter, there are many different drafting jobs that you can do. Whether it is something you want to do full time or even something on the side for a bit of extra cash, there are many options out there to choose from. This article will look at how you can go about making yourself stand out from the other job candidates when on the job hunt. Take a look at your resume and see what skills you already have that you can build on. For example, if you are a guru on AutoCAD, then picking up a similar program such as Double CAD XT or GStarICAD won’t take long and will fill out your resume more. This holds true for many different drafting and 3D modeling programs. Spending a little extra time learning these programs is a quick and easy way to build your resume up. Once you’ve got a solid resume, it is time to do the searching. There are many different avenues that you can choose. The most powerful way and often the most overlooked would be getting a job through networking. A lot of people love to hire people through recommendation or through association. Get in contact with the big players in your industry. Build networks and find mentors. Although many of these people are super busy, you will find a majority that would love to help you out. Staying in contact with people and building the relationships over time will greatly increase the chance of you getting referred to a job or being next in line when a job opening does open up. A well networked person usually never runs out of work to do. Often being able to draft well in one industry means you can use the skills you already have to jump into another. When looking for the right CAD drafting job, don’t only look for jobs within your industry. For example, if you are good at architectural drafting, then there is nothing stopping you from jumping into marine drafting or drafting schematics. Think about where you can apply your current skills into other industries. This will open up a wider pool of jobs that you can choose from. Finding the top cad drafting jobs doesn’t have to be hard. Get connected, be flexible and find creative ways to boost your resume. This will greatly improve your chances of getting the best job for your needs. More details along with the full announcement follow – however, please contact me if you have any questions or if you’d like to speak with a 3Dconnexion representative. I will also keep you posted regarding testimonials in these new application that would make for an interesting case study. AUGI's annual Salary Survey is going on again. This survey is a great way to see how you rank with others in your field and in your area. You can also compare with other fields or other areas. The more people that partake in this survey the better the data will be. Take a few minutes to fill it out. Your submittal will be confidential and anonymous. The deadline is July 10th so hurry up. AutoCAD Exchange: Have you stopped by lately? If AutoCAD Exchange were a movie, I might invite you to “see it again for the first time.” That’s because we recently gave this popular site a new look and feel. 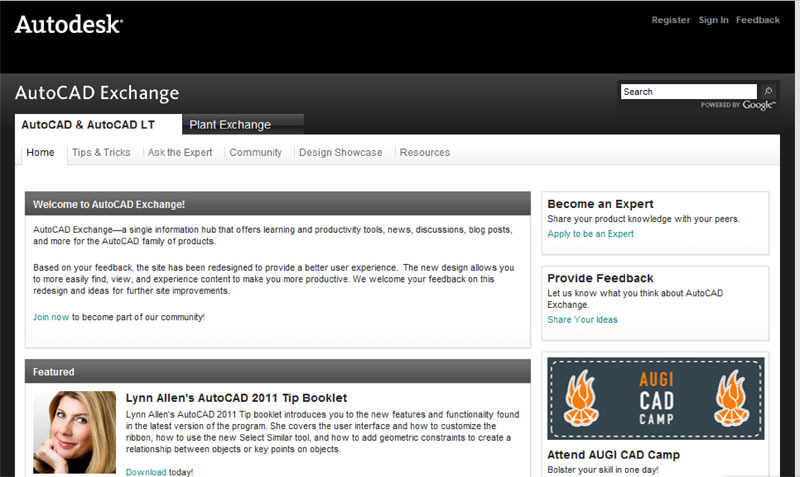 We launched AutoCAD Exchange in March 2009. An average of 70,000 visitors now stop by every month to access learning and productivity tools, discussions, and blog posts related to the AutoCAD® family of products. They also ask questions of colleagues, share work in the design showcase, and network with one another. Based on the feedback from these visitors, we’ve now made it easier to find, view, and experience the content that makes you even more productive with AutoCAD software. Here’s a preview of what we’ve done. AUGI (Autodesk User Group International) publishes an online newsletter every month. The May edition is now up and ready for you to read. As always there are some great articles in it this month. AUGI Board member and President has an informative article on the make up of AUGI's membership. He looks at who we are, where we are and what we do. Mark also has a second article discussion the early years of AUGI. This months CAD Management article offers guidelines for assembling the right number of staff members for projects, the right amount of content for a published CAD Standard, the right size support staff for your company, and more. In The Civil Side, Melanie Santer investigates new and enhanced features in the latest release of AutoCAD Civil 3D. 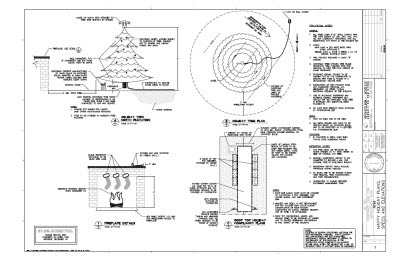 In the Tipniques Column, I continue my exploration of the new features of AutoCAD 2011. Don't worry, I haven't covered all of the details yet! I'll need at least two more columns! Autodesk Labs Program Manager, Scott Sheppard, is our guest Blogger today. he talks to us about Autodesk Lab's role at Autodesk, as well as some of it's history. Autodesk Labs got its start with Shaan Hurley. Shaan was working on our Beta program back then and wished he could involve users earlier. We love our beta programs. We manage them on http://beta.autodesk.com Participants sign up, test the software, and provide feedback under a Non-Disclosure Agreement. Though from the customer perspective this is early in the release process, it’s actually closer to the end of the process in software development terms. So although beta testers may have great ideas like “Why don’t you redo this whole thing this way?”, there really isn’t time to start over from scratch. The primary emphasis of many beta programs is to learn if the software works or not. Our QA teams have already put the release through its paces, but there’s no substitute for having customers try it with their own data to ensure that something is ready to ship. Autodesk Labs was born to involve the customer earlier in the process – where there is actually enough time to act on a suggestion like “Why don’t you redo this whole thing this way?” We are careful to call what we put on Labs “technology previews” instead of alphas or betas, because we want to ensure that there are no misconceptions about something becoming a product or making it into an existing product. We make technology previews available on Labs so people can help shape their future. Some die a quick death. For example, users were not so happy with our attempt at visual search where users could locate parts by drawing crude shapes. Others take a while to perfect but go on to greatness. Autodesk Inventor LT was on Labs for 2 years before becoming a product. Autodesk Impression was one of the first technologies to graduate from Labs. It is now a feature of AutoCAD. As an organization within Autodesk, we have 2 roles. 1. Our Labs team looks at industry trends and creates prototypes that attempt to turn the possible into the practical. Way back before the iPhone, we instrumented a copy of Autodesk Design Review to run on our Perceptive Pixel Multi-touch Wall. We learned a great deal about the gestures that would be appropriate for working with CAD data without a mouse or keyboard. Even further back than that, we created Project Freewheel to see if it were really possible to view 3D (not 2D, 2D was easy) CAD data on the web using just a browser. We learned a great deal about high-end graphics cards that were not common in cloud computing servers like those from Amazon EC2. 2. Our second role is to be a service organization to the rest of Autodesk. We get technologies from various departments and help make them available via the Autodesk Labs site. Most of the items you find on Labs came from somewhere else within the company. The Labs team has worked on Project Freewheel, Project Draw, Project Showroom, ShareNow, and Project Twitch, but everything else is from another part of the company. We are happy to play this role as we encourage other parts of the company to develop their technologies by involving the customer early in the process. We also help with the mechanics of it by creating web pages, email aliases, discussion forums, etc. We also use social media (e.g. blogs, Facebook, Twitter) to get the word out. We produce monthly reports, that I loving call TPS reports in reference to Office Space, that summarize feedback and include site visitor and download statistics. Thanks Scott for being our guest blogger today and for all of the great work that Autodesk Labs puts out. When Project Cooper was placed on the Autodesk Labs site I was impressed. It has gone through several tests, trials, and reviews since it first appeared. Over the life of this Labs Project it has seen several versions and a name change. Project Cooper is now called AutoCAD Freestyle. And today it is released as an official product of Autodesk. • First Law: An object at rest tends to stay at rest, or if it is in motion tends to stay in motion with the same speed and in the same direction unless acted upon by a sum of physical forces. • Second Law: A body will accelerate with acceleration proportional to the force and inversely proportional to the mass. • Third Law: Every action has a reaction equal in magnitude and opposite in direction. These are true in more than mechanics and physics applications. They are true for life. If we tend to do less and less, we will eventually tend to do nothing. If we do more and more, we will tend to do even more. Who has a 3D mouse? If you have one, what kind is it? How long have you had it? What do you like/dislike about it? Would you recommend it? Was it worth it? If you don't have a 3D mouse, why? Are you planning on getting one? What is keeping you from getting one? Price? Won't use it enough? Don't do 3D? What is your opinion about them? Have you ever tried one? Do you want to? The new Autodesk Sustainable Design Center website is launching today! On April 22, 2010, Earth Day, Autodesk will be launching a revised and updated Autodesk Sustainable Design Center website. This new site is intended to provide a one-stop resource for their customers, employees, channel partners, press, analysts and anyone else that want to find the most current news about their (Autodesk’s) sustainability accomplishments. This new site is intended to eliminate Autodesk’s annual sustainability report. Anyone needed that type of information can go to the new website. Autodesk’s purpose in reworking this site is to help individuals and groups that need the tools to work towards sustainability in their design process have what they need from Autodesk to do so. Over the past few years Autodesk has made a highly visible effort to provide tools relating to sustainability in design. It’s a perfect match if you think about it. Most of what civilization comes in contact with these days is and must be designed. Autodesk has had a hand in design our world for over 25 years now. To keep the world going and Autodesk going, they need to provide efficiently working tools, and tools that allow us to design efficient creations. Why should any of use this site and how is it going to be different from the report? It’s hard to say right now because the new site won’t be available to me while I’m writing this, BUT it should provide more up to date information via the web. We won’t have to wait on the report. Also, when I go to purchase design software I will be able to make a better informed decision. IF I wanted to invest in Autodesk, this site will have relevant data on Autodesk’s carbon footprint, and other similar information. Also, there will be sources of information on sustainable design, so anyone that is considering a journey down that path, they can go here for some basic data. Check out the site. I’m sure it will be very useful. Autodesk Labs is one of my favorite places to go. If you have never been there, or it’s been a long time, then go back. There are many projects there to take a look at. The most recently added project is Project Snap. According to the Labs website, Project Snap is a “unified browse and search platform” for Autodesk products. Right now it is only working for AutoCAD 2010 and AutoCAD 2011. They have plans to eventually extend it Revit and Inventor. It might work on AutoCAD Verticals (Like Map, and Mechanical) but the site doesn’t say. I’ve downloaded it and will be trying it out. The free MDITabs Bonus Tools from Autodesk , as reported by Shaan Hurley, Autodesk Blogger of Between The Lines, will work with AutoCAD 2011! I've used this tool in the past and just might download it again, now that it seems to work with 2011. Go on over to his site to check it out and to download it. Thanks Shaan for trying it out for us. SAN RAFAEL, Calif., April 21, 2010—Autodesk, Inc. (NASDAQ: ADSK), a world leader in 2D and 3D design and engineering technologies, today announced a new initiative to provide competitive advantage to displaced workers participating in the Autodesk Assistance Program (AAP) and recent graduates entering the workforce. Here is what is new this week on AutoCAD Exchange. Waheed Akhtar is a Senior CAD Technician at McCormick Rankin Corporation. He has more than 15 years experience with AutoCAD, working on various projects that include tunnels and roads, bridges, canals and related structures, and buildings. He specializes in the creation of new line types and hatch patterns, 3D drawing, digitizing, and CAD standards. Ged Trias is the Associate Director of Design at the Larson Darby Group, based in Rockford, Illinois. Here, Ged explains what his company does, and how long he's been using AutoCAD. Ged Trias talks about his favorite features of the Autodesk Subscription Program and how it can save his company money. Many operations in AutoCAD can be done directly with the mouse, or by using tools in the user interface and following prompts. This video demonstrates how to create, view, and modify 2D objects in a drawing. David Cohn talks to Heidi Hewett about adding realistic lighting to AutoCAD visualizations. Deni Cox of CAD-1 talks about the questions she receives as a Technical Specialist, and how she fields questions about the Layout Tab. Heidi Hewett of Autodesk talks to CAD consultant Donnie Gladfelter about how important it is to experiment with AutoCAD and customize the user interface. He also shares a tip for what to do if you need to undo a customization.